Here’s an easy way to have 3 different meals out of the same piece of meat, and you just have to cook once. Out of a chuck roast, you will make pot roast, barbeque beef sandwiches, and then beef tostadas. First, make a pot roast big enough to last over 3 dinners. The Pioneer Woman gives detailed instructions here. Or, you can follow my not-so-detailed instructions. Spray a roasting pan with oil. Lay meat inside. Salt and pepper the meat all over. 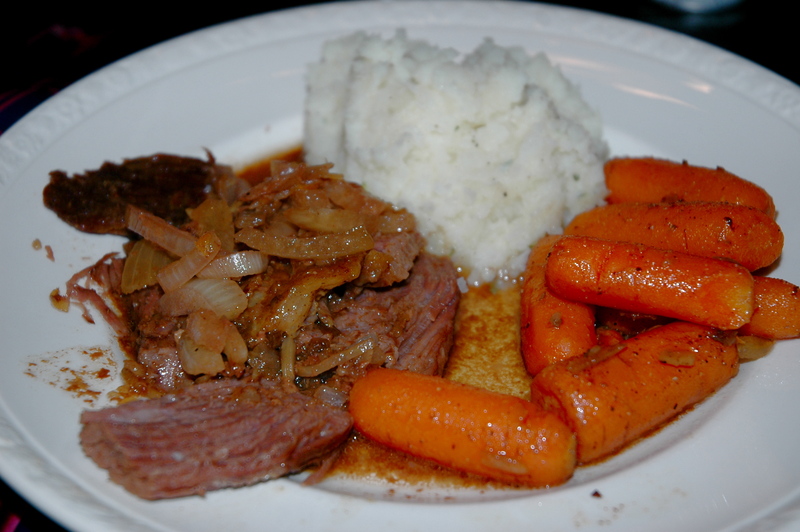 Throw some quartered onions, baby carrots, and garlic cloves to the side of the meat. Mix a packet of Lipton Onion Soup Mix with about a cup of water and pour over the meat. Cook covered at 300-325 for about 4 hours. Test it, and if it falls apart, it’s ready. If it seems a little tough, cook it longer. That’s the pot roast trick – cook it LONGER. Take the leftover meat and shred and chop very finely. Store or freeze until you’re ready for your next meal. For the BBQ sandwiches, mix half the leftover meat with gluten-free barbeque sauce. Heat and serve on gluten-free hamburger buns (you can find them at Whole Foods) or on gluten-free bread (my preference). You could also serve over rice. For the beef tostadas, mix the rest of the beef with taco seasonings like you would for ground meat. 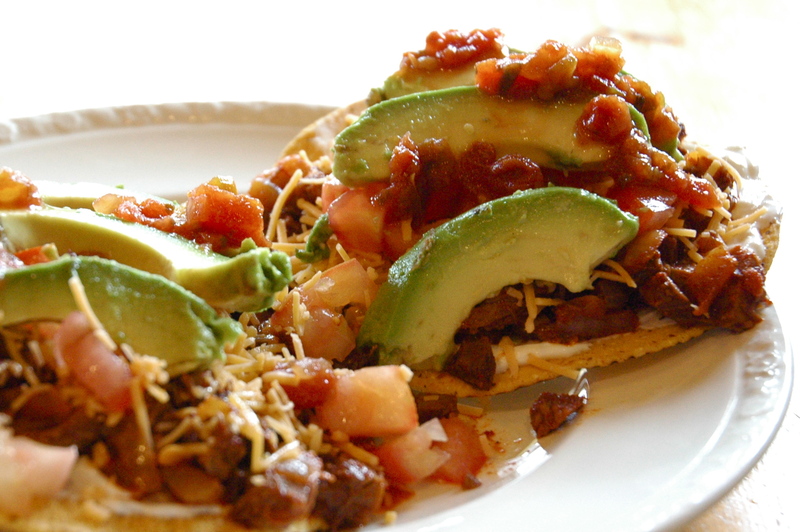 Serve on tostadas, tacos, or corn tortillas. I love cooking in bulk! It saves so much time. And, lest you think that I come up with these ideas because I’m so organized, I’d like to share the truth. Last week, I made roast on Sunday and had leftovers. I planned my days so poorly that dinnertime came around and I had no ideas or time to get anything ready. I peeked into the fridge in desperation and had to do something with the leftovers. Not once, but twice. Sometimes, creativity trumps planning.